THE FINE ART DINER: Now You See Me Opening Scene & Star Trek News!!!!! Now You See Me Opening Scene & Star Trek News!!!!! Each represents--we could say--a magician dominating a different part of the potential demographic through a different realm of a "possible stage": who would think a ferry could be a stage for a magic act? Good targeting of a possible audience, they don't have anywhere to go so why wouldn't they "pay" (a pun on him being willing to pay if anyone can figure out how he does the trick) attention to Jack (Dave Franco)? The trick really becomes a trick with the pickpocketing act (stealing the wallet), because that's a hyper example of knowing your audience; in other words, ﻿﻿we have been talking about the "implied reader" or viewer a lot lately--what we know and what the film makers know we know and are willing to "tap into" in order to establish another line of communication with us--and we see Jack doing the same thing. Jack knows someone in his audience probably knows how the trick is done because of all the expose shows on television, so instead of tossing the trick out and replacing it with a new trick that hasn't yet been "exposed," he uses "play" to find a creative means of adding a new dimension to the trick, the pickpocket. The scene becomes a mirror-reversal of what is said: instead of Jack paying someone if they can figure out the trick, if someone figures out the trick, they pay Jack (with their wallet). 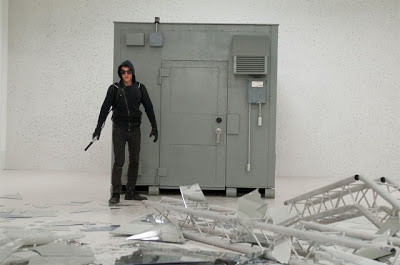 I don't know about you, but this safe reminds me of the one in Fast Five (Fast & Furious 5), the one the group heisted in Brazil. If this is an accurate correlation, it wouldn't be the only invoked concept from Fast Five, including Hobbs (Dwayne Johnson) because the FBI detective played by Mark Ruffalo is named Dylan Hobbs. Why is this important? Like Jack knowing someone in his audience probably knows how the spoon-bending trick is done, so the film knows what films we are likely to have seen as an audience, and it wants to "pick our brains" to deepen and expand the message it's sending (but we won't know that until we see the film). It's like when you are listening to a Protestant minister giving his sermon and he has you flipping your Bible pages to read as many different passages as possible, supporting what he is saying: it's builds credibility and, again, that idea of unity that numerous films are saying the same thing. When we keep seeing the same concepts over and over, and hearing the same messages again and again, we are being--quite frankly--indoctrinated with an idea, whether it's something we all ready believe or not. That's the whole purpose of decoding art, knowing what kind of indoctrination is being put out there to which we might be subjecting ourselves so we can separate ourselves from it and take a more objective examination of it rather than just passively receiving the message. ﻿﻿It is, perhaps--even likely--that the story chooses to follow the old rule of playwrights: if someone is going to be stabbed with a dagger in the final act, that dagger has to be introduced in the first act (or at least by the end of the second act) so it's believable to the audience; there's also a deeper reason for this, namely, that the death of the person stabbed has meaning. It would have been enough for someone to just wear a dagger on their side, but introducing a dagger displays a symbolic identity with the object and thereby--when it's used in the death of someone--that symbolic meaning intercepts, or over-comes--whoever is being killed. So, if these devices of knowing what someone knows to profit by it, and reversing the mirror image, is being introduced in the opening scene, it's going to be used later on in the film. Deceptively simple. We know, from the trailer, that Michael Atlas (Jesse Eisenberg) tells Hobbs (Ruffalo) that Hobbs "has nothing up his sleeve." That doesn't mean that Atlas doesn't have anything up his sleeve, and we can tell because of his sweater. One, Atlas wears an under-shirt beneath his sweater, drawing attention to the fact that there is "something underneath" with him (compared to Hobbs who just wears his shirt and tie); secondly, no one wears shirts/sweaters anymore with the suede/leather elbow patches. That's not in style, and we can presume that the film is taking place today, so this is completely out of place. Since it invokes his arm, we can assume that, even as he tells Hobbs he has nothing up his sleeve, that doesn't mean that Atlas doesn't have anything up his sleeve. What is in the room? Behind Hobbs is a typical, one-way mirror, and we know there is also a one-way mirror in Man Of Steel when Superman (Henry Cavill) talks to Lois Lane (Amy Adams). From trailers of Now You See Me, we know illusion and mirrors play an important role in the film, so what can we say--at least at this point--about that mirror in the room? We know that Atlas will put the handcuffs that are on him onto Hobbs; the mirror in this scene acts to invert the reality of Atlas being a prisoner to invert the scene (the way a mirror reverses what you see when you look into it) and make Hobbs the prisoner bound in cuffs; look at how Hobbs holds his hands, the right wrist holding the left, as if he is all ready bound by the cuffs and Atlas is free (Atlas' hands being spread out wide). So this leaves us with Alma Vargas (Melanie Laurent); what about her? According to my research, she's an Interpol agent assigned to help FBI agent Hobbs, but suspicion has been cast on her character that she's possibly aiding Atlas. Her simple black and white outfit might be communicating this to us but we won't go into that here because it's just a long supposition, we'll save it for later, but we can't ignore the Diet Pepsi can on Atlas' right. Pepsi is a major brand name, an international corporation, so we will need to keep our eyes open to other corporations which might be making an appearance in the film as targets or accomplices to the heists taking place. Lastly, there is a fourth person in the room: us. Just as we discussed the noise in the room coming in to create static over what Lois Lane tells Superman in Man Of Steel, and that being the audience "imposing" our own storyline onto the film, so the movie screen acts as its own one-way mirror in Now You See Me, reflecting what we think we are seeing, whether we see it or not (please see Trailers Man Of Steel for more on the one-way mirror and the noise indicating the presence of the audience). One last detail: the names. As we mention above, Ruffalo's Hobbs could be a reference to F & F 6's Hobbs played by Dwayne Johnson, to Hobbes of the comic strip Calvin and Hobbes, which many people are familiar with or--and this is most likely, the philosopher Thomas Hobbes who incorporated the theory of the prisoner's dilemma into his philosophy of the social contract (if you have a minute, you might want to read that link, it's thorough without being too academic and has highly practical applications for what we do at this blog). Michael Caine plays Arthur Tressler; is he actually the "author" of the crimes? Jesse Eisenberg plays Michael Atlas. There is the "atlas" of a map which might refer to the traveling the group does, but there is also the Titan of Greek mythology Atlas who holds up the world as well as suggesting the title of capitalist Ayn Rand's book Atlas Shrugged so, how, if at all, will these concepts play with and build up the characters of the film? This will probably be one of those we will need to watch a couple of times, and even then, won't catch everything. 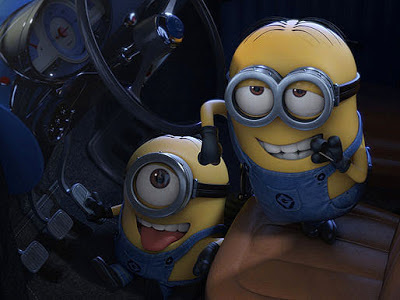 Having seen Despicable Me recently, I am anticipating Despicable Me 2 for a number of reasons. First, the evil bank where Gru the villain/hero goes to get his loan is Lehman Brothers, the company triggering the 2008 economic crisis, so the film displayed an apparent self-awareness with the outside world and wanted us the audience to know it. The film made an academic study of "false self-interest" which is the ultimate evil in bad capitalism (for example, Gru adopts the three girls out of the self-interest of them selling cookies to his villain-rival, but finds the self-interest he should have sought was the love and happiness the girls brought to his life). Even though all the minions look just alike (two are pictured above) Gru knows their individual names and stories and shows them love and real bonding by the end. We can say this is an accurate interpretation of a "reformed villain" because of the premise of Despicable Me 2: a really bad villain is on the loose and Gru is consulted to help the Anti-Villain League bring him to justice; this appears to be a theme in films now, Fast and Furious 6 for example, with Dom's crew (Vin Diesel) being outlaws helping Hobbs (Dwayne Johnson). In the image above, two minions have been driving a car, neither of them capable of doing it on their own, but--with team work--they can. Where have we seen this before? Madagascar 3: Europe's Most Wanted and the penguins driving. Despicable Me 2's Lucy Wilde of the anti-villain league. What should we notice about her? Her badge is upside-down. This indicates one of two possibilities: either she is all ready romantically interested in Gru and uses her job to get involved with him, or she's actually a villain herself. 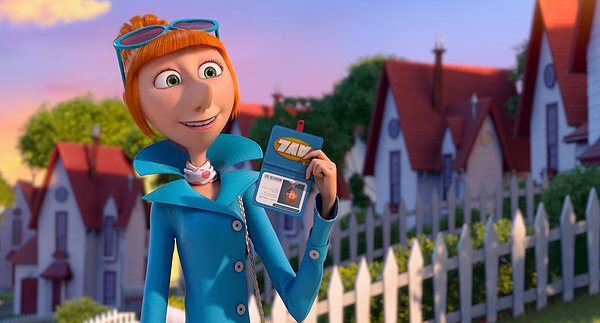 Her character can be compared to Miss Hattie of the orphanage where the girls lived and with whom Gru somewhat flirted to qualify for the adoption process. 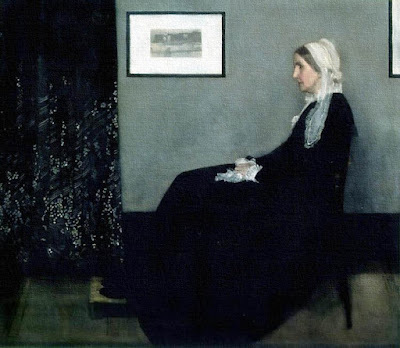 Kristen Wiig plays both female characters, so it's not an arbitrary connection, but such a minor detail can have huge consequences for the structure of the narrative. One version of Hercules will be played by Dwayne Johnson (The Rock of the wrestling world) and also boasts Ian McShane (Pirates of the Caribbean: On Stranger Tides, Jack the Giant Slayer)﻿﻿, Joseph Fiennes (Shakespeare In Love, Elizabeth), Rufus Sewell (The Illusionist, Abraham Lincoln Vampire Hunter) and the incomparable John Hurt. Slated for release next summer, the film takes place in barbarian Thrace--instead of cultivated Greece--whereas Hercules 3D stars Kellan Lutz and is focusing on the 12 Labours of the demi-god. All these films have their roots in the world of mythology, not to mention Percy Jackson & the Olympians: Sea Of Monsters also coming out this year (which, thankfully, has a new director from the first installment). Why? The purpose of mythology was to explain why the universe was the way the ancients observed it was, and to explain their origins and destiny; it's easy to see, in this tumultuous time, that Americans need the same thing. Last note, at this point, I don't think I am going to see The Great Gatsby this weekend (it's all ready being touted as the first bomb of the summer). My sister isn't going to be able to make it, and it's so blatantly anti-capitalist (I could be very wrong, as always, but it looks like very poor quality to me, on every level, and I'm just not in the mood), I would rather see it at the discount theater next week and work on getting some small, but important posts up instead. I might change my mind, but at this point, I am not planning on seeing it for its opening weekend.